Last week I emailed Jonny to let him know that I had just published my 150th article. I thought it was about time I checked up on the rest of the blogs stats, to see if we had any other milestones coming up, and as it turns out we do! In fact, we have a lot. For starters this is post number 300 and today the blog turns one and a half! The blog launched on the 13th of April 2011, making it 1 year and 6 months old – 549 days old today. That means that we post a new article on average every 1.8 days, averaging 3.9 posts a week. Basically we publish around 4 posts a week. Not bad. This is my 151th article, which means (as I mentioned above) I have just hit my 150th article milestone. Go me! I started this blog with the aim of it being a community project. Yes I understood that for at least the first 6 months I would be contributing almost all the articles, but as time progressed, my aim was to develop the blog so that we have a range of writers who contribute great content, so that almost every day you can log on and read something interesting written by a different writer. When we started, way back almost a year and a half ago, we had just 11 post categories: Blogging; Computing; Internet; Media; News; Search Engines; SEO; Social Networking; Technology; Updates; and WordPress. Since then categories have been split down into Specialist Post Types and Topics. New topics that have been added and filled thanks to new writers include: Apps (notable contributions from Ron and Steve), Browsers, Business (notable contributions from Andrew), Charity, Software, Tablets, Gadgets, Smartphones, Games, VoIP, Media, Science (notable contributions from Jonny), and Environment (again notable contributions from Jonny). So a year and a half in how does it look in terms of the writer balance? Take a look at the image below, the people represent the articles our writers have written. 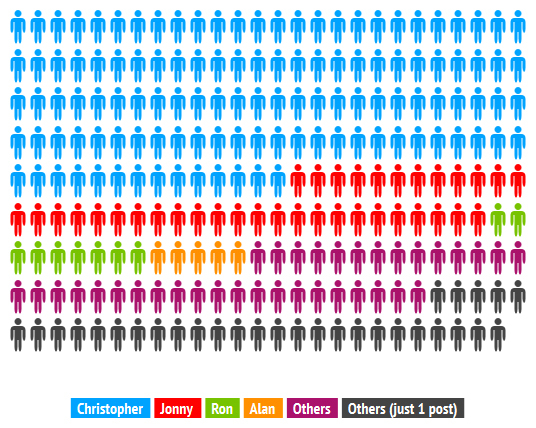 An image showing the different writers who have contributed posts for Technology Bloggers. Considering on an average blog around 90% of the content comes from one main writer, with guests occasionally writing a post or two, I wouldn’t say we have done that bad. For your interest, around 50% of the content has been written by me, around 16.5% by Jonny, Ron and Alan have jointly written around 6.5% and other writers make up for the other 27%. Jonny is soon to reach a milestone of his own, as he will soon have written 50 posts for the blog. In terms of comments, our count currently stands at 3,445 meaning that very soon we will hit the 3,500 mark. With 300 posts and 3,500 comments, we currently average around 12 comments a post. This is a mementos post. With so many milestones converging around the blogs 1.5th birthday, I felt that we needed something to celebrate. So, I have made something which I think fits the bill! May I introduce to you, Technology Bloggers new logo! That’s right, we have a new logo! I have been meaning to update it for a while now, as many of the people who were in the old logo weren’t actually part of the community. Equally, there were many valuable members of our community that were missing from the logo. Unlike the last logo, this one actually has a design theme. Every avatar that is featured in the new logo is a member of the Technology Bloggers community. The stem of the T (the upwards bit that looks like this ‘|’) is made up of all our current writers. Any writer with an avatar features in the stem of the T. The top of the T (the cross-wards bit that looks like this ‘-‘) is made up of avatars of commenters. The commenters featured are the commenters who have left the most comments to date. You may notice that four people feature twice in the logo, me, Jonny, Alan and Ron. The reason is because we are both top contributors and commenters, and that is why we join the writers part of the logo to the commenters part of the logo. The logo was one layer short and looked a bit distorted, so I needed another row of writer avatars (which I didn’t have) so I had to work out what four avatars to use to plug the gap, and as we have jointly contributed the most comments and articles, I thought it should be us. This is almost certainly not the last logo update, but it is our new logo for the time being. I hope you like it – I think having avatars from actual members of the community in it makes is better and I hope you do to. The logo was designed on the 6th of October and launched publicly on the 13th of October. A whole community of technology bloggers! Founder and editor of Technology Bloggers, Christopher likes learning and enjoys writing on the blogs diverse range of topics. Christopher has a masters degree in business management. He enjoys helping other people and likes to give back when he can. Christopher follows Formula 1 and enjoys karting! Find out more about Christopher on his website. Bring on the next 300. A well worked 18 months Christopher, and congratulations to all. Wow! You and the team have made remarkable progress in a short amount of time. Congratulations! Sorry for your loss. I read your articles, however didn’t really want to comment as I wasn’t really sure what to say. So many milestones together ! A very big congratulations to you Christopher and also to the whole community.. The blog has been a great source of information in the past 18 months for all its readers. Hope to experience the same in the future. Btw, the new logo looks great. Reminds me of TED. With regard to TED, do you meant this TED? WOW ! Seems like just yesterday when i read the first post on the blog by christopher. Its surely been a great journey so far and clearly this is just the beginning?